This morning Labour is blaming the voters for failing to be inspired by their brand of austerity over the Tories'. Labour AMs and councillors in Wales will now spend the next 5 years - if their feebleness in opposition allows the government to limp on that long - repeating their current mantra "there's nothing that we can do" as they continue to make Tory cuts. Labour leads the Welsh Government and half of all councils as well but their attitude that there is nothing they can do except parcel out Tory cuts means that they have failed to use these positions to defend working class people and working class communities. Welsh Labour MP Chris Bryant is quoted by the BBC as saying that elections are won on the centre ground but Labour loses when the left is disunited. Well perhaps Labour should stop posing as a left party and clear the road for real lefts, socialists and trade unionists to actually fight the Tories instead of trying to compete with them on their own ground as Labour does now with their 'me too-ism' on making cuts. In the end Labour achieved a double-whammy of failing to compete with the Tories on their ground and alienating large swathes of working class people and trade unionists as well. It is clear that Labour's adoption of austerity-lite effectively disenfranchises millions of working class people who have no politicians representing our interests. 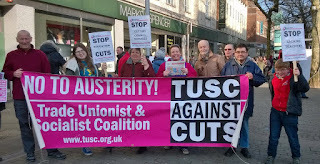 Will the biggest trade unions now draw the conclusion that they need to act to secure political representation for their members by creating a new party, which can build on the pioneering work of TUSC? For TUSC supporters nothing changes with this result we will continue to fight as hard for the policies that we fought the election on. We will be fighting in our workplaces and trade unions for the raising of the minimum wage to £10/hour and end to zero hour contracts. We will be fighting in our communities to end all cuts. We will continue to raise the idea of socialism - organising society for people's needs and not the profits of a few. TUSC is not just for elections. If you want to fight back against this Tory government that Labour's failures have saddled with, then get in touch.